Data Plotting for Excel (EZPlot) provides and fast and easy solution to create multiple data plots from Excel. Data Plotting for Excel enhances productivity for plotting data by providing the ability to create many plots at the same time. Complex commands do not need to be remembered and executed as the intelligent user interface allows specification of all parameters upfront including fonts, colors, scales, trend lines and more. Create multiple Y axes on each plot chart or from existing Excel charts. Creates real contour plots using any data (rectangular, nearly rectangular, or irregular data) and including a data generator for polynomials or any equation. Generate up to 50 or more plots in seconds. Use parameter names instead of cell ranges to select data. Captures changes made to Excel charts and automatically generates a plot script that can be used later. Performs data calculations including functions for 2D interpolation, 3D interpolation and polynomials that can be used like any other Excel formula. 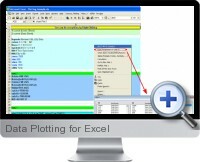 Also available is Contour plotting for Excel 2011 for Mac.